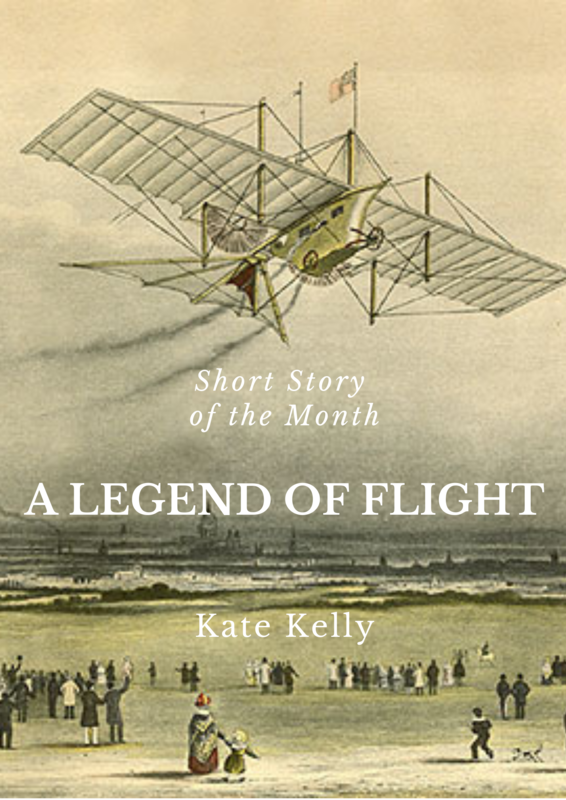 Our new Short Story of the Month is 'A Legend of Flight' by Kate Kelly. 'The night you didn’t answer. I laughed - That’s just crazy. It was you who went into the shop that first time. I think it was Sally who dared you. But it might have been Meg the Goth. I don’t remember. All I remember is watching you as you leaned on the counter, lit by the glare of the shop lights, while we huddled together on the wall beneath the wings of the plane and watched. He’ll never get served, Meg the Goth had said. But I watched as you charmed that fat girl. I don’t know what you said but I saw her lower her eyes and blush. I saw her giggle. I think she really fell for you. Then she glanced round to check that no-one was watching, and handed over the bottle. You came back to us, full of fire, that night. The vodka burned as I gulped from the bottle and you laughed as I gagged, passing it back and forth between our little group. The night lost its chill. The town didn’t seem so dull. So that became the pattern of our summer. A bunch of misfit kids with no money and nothing better to do. My parents didn’t care, and I guess neither did any of the others. But nobody really said and nobody ever had to be home by any set time. We drank and we smoked and the town carried on around us, oblivious and uncaring. We would still be there when the pubs closed and the lights in the houses blinked out. Sometimes I crept home in the small hours when the street was asleep. But my house was empty, just the cat waiting on the stairs, wondering why nobody had bothered to feed her again. In the morning, while I slept off the effects of the night before, I would hear Dad come in from his shift. Sometimes he looked in on me, but most of the time I was left alone. I would huddle under my duvet and wait for his soft snoring to start. Then I would hang around the house, watching YouTube videos, until I got bored of that too and wandered back out to find the others around the plane. One night as thunder darkened the skies and the electric charge in the air seemed to exaggerate the effects of the drink, you climbed up onto the brass plane and stood with a foot on each wing. You looked a bit like one of those wing walkers you see at the carnivals down by the coast, flying back and forth along the beach while everyone is really waiting for the red arrows to turn up. You held out your arms, bottle in hand and challenged the encroaching storm, head thrown back, eyes wild. Look at me I’m flying, you called to the lightning that split the sky. I am a legend of flight! I laughed at you that night and Meg the Goth screamed at you not to drop the bottle. When you climbed down, as the first fat drops of rain splattered onto the warm tarmac, you singled me out. That was the night we first kissed, your mouth tasting a mixture of vodka and fags. After that it was you and me. And the vodka of course. I hardly noticed the others, although they were always there with us, shouting at the world, drinking and smoking the summer away; wishing we lived in a town where there was something – anything. Anything other than the long dull days of scorching sunshine and the sticky humid evenings. And yet not wanting the summer to end. Nobody ever wanted to go back to school. One day we gathered and the fat girl in the shop wasn’t there. You went in anyway but the manager came out and you re-joined us by the aircraft, disappointment in your eyes. What happened? I asked, and you shook your head. They fired her. Serving alcohol to the under aged. Serving alcohol to us. That was when we moved onto the pills. You said you got them from some bloke who drove a fork lift truck at the local builder’s merchants. Someone’s brother, you said. Best that we didn’t know. Then if anyone asked we wouldn’t be able to tell. You never said what they were, but they weren’t always the same. The first lot was round and white. We took them together on the count of three and waited as our heads started to swim. It wasn’t the same as the vodka. It wasn’t as good. Then there were pink ones. They made me sick. Today though, today you were bringing us something new. I looked at my phone again, checked messages, checked Facebook. I checked everything. Why didn’t you call? “Then someone else should go.” She turned to face me, a challenge in her eyes. I kept checking my phone. We sat in silence. A police car dashed past, blue light. It fired up its siren as it reached the junction, shrieking at the cars to move out of its way. Red brake lights. Flash of indicators and the blue light swept past. Meg the Goth giggled. A relief we all felt. One night the cops had rounded us up and driven us home. Some to angry parents. Me to an empty house. They said they would speak to my father but he never said anything. Maybe they never did. Maybe he simply didn’t care. Another blue light. Another siren. A police car and an ambulance in rapid succession. We sat up, took interest. Something was happening in this dead end nothing of a town. Something exciting. And you weren’t here to see it. You were missing it all. Everything fell silent. A town that was holding its breath. Meg stubbed out her cigarette. The boy in the shop looked out, then went back to serving his customers. I sent you another text. There’s police, everywhere. Something's happening. I pressed send. You still weren’t answering. A man approached, walking his dog, a small white terrier that tugged on its lead. He was old and frail, dragged along. The dog was in charge. “What’s happening?” Meg called out as he passed us, shuffling gait, the dog’s breath rasping, half strangling itself as it strained on its collar.